New Orleans You just have to love the irony of the government bashing, back-to-the-basics, tri-corner hat wearing Tea-people now lining up at the whining wall to weep about the fact that the Internal Revenue Service is not bending over backwards to give them tax exemptions by joining the pretend party that somehow their purposes are in any way “charitable.” Even in the tedious and trying world of IRS regulations, charity is still not defined as kicking around women, immigrants, and just about everyone other than your buddies at the VFW bar. Seems a sweet sixteen of the groups banned together and hired a rightwing shyster who normally works on trying to break down the barriers between church and state to pretend he was a tax expert and yell at the IRS to give them tax breaks for their miserly contributions to their hater groups. Some of the sweet-16 are the old Glenn Beck (remember him?) 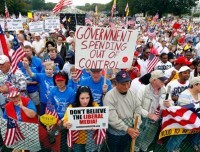 9/12 groups which I got to know well in 2009 in Springfield and Memphis when they picketed events where I spoke. To be tax-exempt as a social welfare organization described in Internal Revenue Code (IRC) section 501( c) 4, an organization must be primarily engaged in the promotion of social welfare. The promotion of social welfare does not include any unrelated business activities or intervention in political campaigns on behalf of or in opposition to any candidate for public office. Heck that might even include your main activity of showing up and heckling Congressional representatives when they hold “town hall” meetings in their districts to get constituent input? Don’t get me wrong; go wild, Tea-people! Just don’t ask for special tax breaks for doing it. And, don’t cry about it, just cuz you’re cheap!